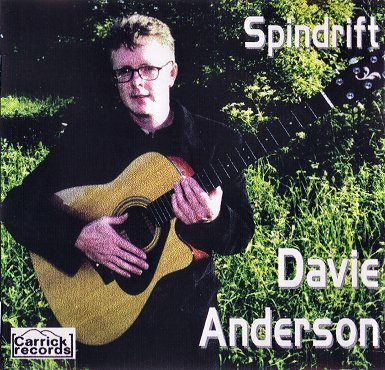 Davie Anderson has a wide range of material featuring traditional Scottish Folk music featuring the songs of Robert Burns as well as his own compositions. Touring around Scotland and hitting the wild mountains regions of the Highlands in between gigs is one of his favourite things in life. He has played in such places as Skye, Harris & Lewis taking the songs of his native Ayrshire to predominantly gaelic speaking audiences. Maybole man Davie Anderson has been described in previous newspaper articles as being a 'fine ambassador for Scotland'. But things could have been so different for the 38 year-old if he hadn't been involved in a motorbike crash when he was only 13. "I was going down the Garpin hill on a motorbike with no engine, wearing no helmet, when I went straight into a landrover at Dalduff corner. I ended up in Seafield Children's Hospital in Ayr with a fractured skull and no skin left on one of my arms. You could say it caused a fair bit of heartache for the family at the time," Davie said. 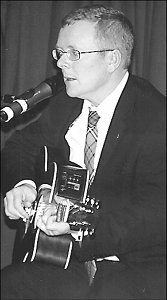 Despite the worry he caused his parents, the months Davie spent in the house recuperating gave him ample time to learn what he was to become best known for in this area - playing the guitar. "A friend of the family, Donald Johnstone, handed in a guitar with only two strings on it to keep me occupied while I was laid up in bed, and my mum got a full set of strings for it when she realised it was doing the trick. "That's basically where my interest in music and the guitar stemmed from. Apart from Donald, Davie is also grateful to late family friend Bill Zokas, who lived in Glasgow: "When mum and dad saw I was taking to the guitar, Christmas was coming up, and they bought me an amp and new guitar from Bill. "Me and my old pal Gavin Loch, a drummer, used to play in my mum's front room at Crosshill. "Big Rocky Watson used to listen to us at the window on his way past, and asked one day if we wanted to start up our own wee band." The boys did just that, and Davie fondly remembers their early days : "My very first outing with Rocky was at the Welltrees in Maybole. Donald Graham had it at that time and we got great turn-outs. 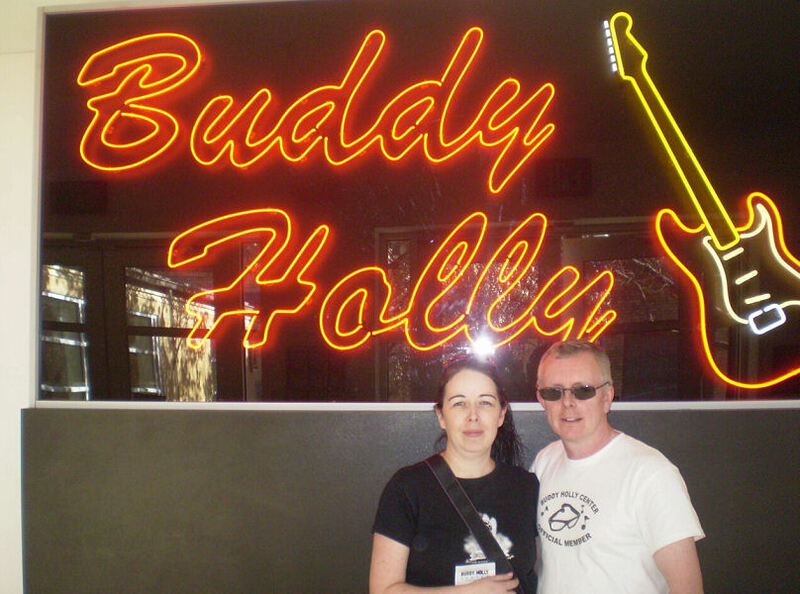 We also played a lot out at the Royal Hotel in Crosshill, which was really booming at the time." That band went on to become popular local outfit, The Black Eyed Peas. Referring to the international rockers of the same name, Davie laughs: "We had the name first by the way, so we could probably sue them if we wanted to!" The Black Eyed Peas were together for eight years, and during that time, Davie credits their manager, Chick Graham, for getting the band "some of the hottest gigs in the whole of Britain." He added: "Chick pestered everybody to let us play, and just in case anybody ever wondered, it was him who was responsible for the infamous black van with the Scotland flag and Elvis on it!" 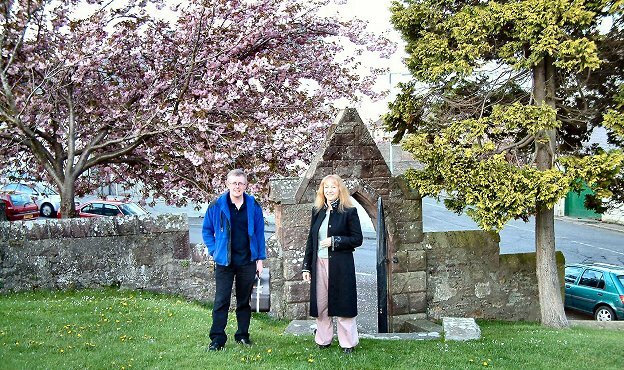 Before the band went their separate ways, they were invited to Irvine to play at the birthday party of singer Eddi Reader's dad, and they were thrilled when she got up and sang with them that night. Before The Black Eyed Peas era, it was while he was a pupil at Carrick Academy that Davie met who was to become his next band mate, fellow guitarist Kenny Brown. "Me and Kenny used to go up to his house at lunchtime to practise, and although I don't read a note of music and am self-taught, I really learnt a lot from him," he said. The pair later formed their own band, 'Monkey Business,' which Davie describes as "a great couple of years." After the demise of the Black Eyed Peas, Davie reformed with some of his old band members and set up current operation, The Peas, consisting of long-time friend Gavin Loch, Bass player Jimmy Murdoch and Michael Andrews. With hundreds of gigs under his belt over the years, Davie describes the Peas recent high profile job as backing group to Linda Gail Lewis, sister of rocker Jerry Lee, as "one of the best nights in my music career. It was amazing." The gigs at Stranraer Rugby Club and the Crosshill Arms last month were organised by Girvan couple Des and Linda Johnston. "Des had heard us play in the past and when it was decided that Linda Gail was coming to Scotland, Des asked us if we'd be her backing group, and we agreed. "When Michael first read the local paper in February and saw our name in the same article as hers, he said he had to go straight to the toilet!" "We were all a bit feart before we met her, but when we did, it was 'darlin' this and darlin' that' and she put us right at ease." Despite only having time for one hour of practice with Linda Gail before taking the stage, Davie said: "We felt under pressure, but we knew we had to perform well for her as she's such a big star." Also known to pals as 'Wee Mealy,' Davie always had a passion for music, and as well as playing the guitar, is also an accomplished singer. "I've always been a fan of the 50's and Buddy Holly, as well as Scots Folk music and the music of Robert Burns, and I could also do a mean yodel when I was younger!" His interest in the Bard progressed after going to a Burns Supper a few years back, but thought the music was too "ballady." He said: "I don't think Burns meant his music to be sang like that. He only had a fiddle and a Spanish guitar available to him at the time and I just I could try singing Burns in a different way to everybody else." That's exactly what he has done, and so far, he has made two albums, with the third in progress. "This latest album is taking longer than I hoped it would to complete, but it consists of mostly Burns music, but with a slant." Working on the album with Davie is his Peas colleagues Jimmy and Gavin, who he praises as being "amongst the finest musicians around Ayrshire, if not Scotland." 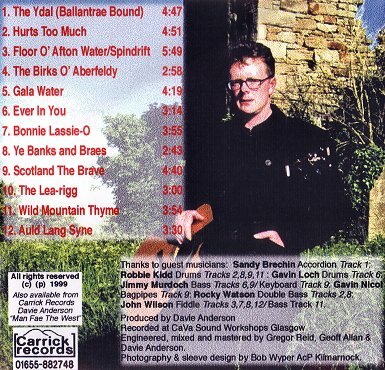 His first album, 'Man Fae the West', was completed in 1995 and sold well locally. The title song on that album, 'Wallace fae the West,' earned Davie the Freedom of Stirling, an honour he takes great pride in. "The song was entered into a competition and won, which is how I managed to be bestowed with the Freedom of Stirling. I was very chuffed at that actually, and there was a really good picture and article about it in the Sunday Post!" Davie has lived in Maybole for the last 16 years, but along with wife Joan and daughters Fiona (9) and Yvonne (7), still spends a lot of time in the big city of Crosshill, where his parents still live. "I class Crosshill as home, even though I could be described as incomer! "I was born in Irvine and we lived in Kirkmichael until I was four, before settling in Crosshill." When he's not working at his day job, Davie partakes in a spot of hill walking, but even then, music isn't far from his mind. "My brother Gordon is my inspiration for the outdoor life, and we often combine the hill walking with the music. We book gigs before we set off, and I recently done one at the Droves at Loch Lomondside." He's also been a member of the Masonic Lodge for the last five years, something which he regards as an important part of his life. "The Masons is a great organisation and does a lot for many people, even though they might not understand much about us. "There's two Lodges in Maybole, so make sure you get it right by saying that I'm in St John, Maybole Number 11!" 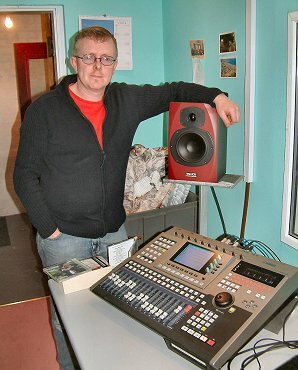 He also has a passion for Scottish History, so much so that when the movie Braveheart was in production, he tried to get involved with the sound music for it, but had left it too late. "There's a new Robert Burns film being made and I want to put something forward for that," he said. "If they do it right it'll be bigger than Braveheart so I look forward to seeing what they come up with." Over the years, Davie has travelled far and wide to take part in various events including a Burns' Supper in Germany and St. Patrick's Day celebrations in Ireland last year. He also become a bit of an international artist when Bryce McCulloch invited him to join Maybole Pipe Band to an Interceltica festival in Spain a couple of years ago. And last year, he participated in the Burns an' a' that Festival with another local singer, Frances Dryburgh. Davie described their concert as 'great'. "There was a lovely atmosphere there and I'd be keen to do something for the festival again." 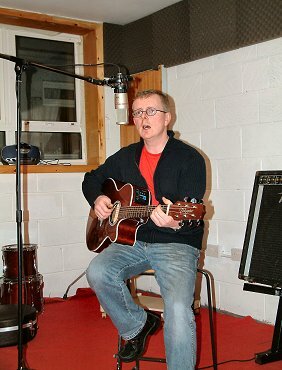 These days, Wee Mealy spends a fair amount of time in his very own recording studio, which has already been used by other local musicians making CD's. Anyone interested in finding out more about this should contact him at davieanderson1@btinternet.com or telephone 07812954778. After a long and varied love affair with music, is Davie a tortured soul who wishes it was his Black Eyed Peas or just himself who shot to fame in the record industry? "I've no regrets about anything. You have to be in the right place at the right time to make it in the music industry, and at least I've been able to do what I want with my music. Anyway, I'm still working on making the big time!" Davie says he'll keep plugging away and enjoying what he does, which is mainly concert and rockabilly stuff these days. "I like to think I'm still creative and can achieve more, which is lucky, as the pace of modern life doesn't allow people to be as creative as they can be. "I feel just as comfortable singing Burn's songs as I do backing a rock 'n' roll star like Linda Gail Lewis, and it's good to have that contrast." This article used with permission of the Carrick Gazette. Original article in pdf format. Copyright Notice The music samples above are the copyright of Carrick Records and may not be distributed or reused in any manner without permission.